For the first time since his government came to power in May last year, Indian Prime Minister Manmohan Singh finds himself under attack from all sides. As the monsoon session of the national parliament begins in Delhi, Mr Singh must be finding his seat a little too hot for comfort. The shy and soft-spoken economist-turned-politician has in a matter of a few weeks become the favourite target of everybody. The opposition is gunning for him. So are the Communists who have not joined the Congress-led coalition government but are lending it crucial support from the outside. Even many senior Congress leaders, including some ministers, have begun to criticise him none too discreetly. It is not an easy position to be in, especially for someone like Mr Singh, a reluctant politician who has always been seen as a scholar first. Critics say this image has in fact been assiduously cultivated by the prime minister himself. But others argue that such a conclusion may be a little too harsh a judgment on someone who is seen by many as a symbol of honesty in what's widely regarded as a corrupt political system. So why is Mr Singh under fire? 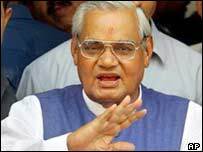 According to the detractors - who include opposition Bharatiya Janata Party (BJP) stalwarts like the former Prime Minister, Atal Behari Vajpayee - the prime minister is compromising national interest. It all started with Mr Singh's speech at Oxford earlier this month where his opponents say he lavished needless praise on the days of the British Raj. His remarks praising the British for their good governance, and their legacy of a judiciary, police force and the civil services all attracted severe criticism from a wide cross-section of political foes and friends. 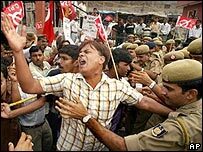 They accused the prime minister of glorifying the Raj and insulting the entire freedom movement, including those who sacrificed their lives trying to oust the British from India. 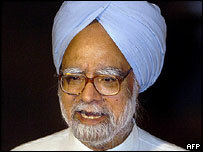 Mr Singh's close aides however deny that he got carried away by the occasion and made a mistake. They argue that his comments should be seen in the context of India-UK relations of the present, not of the past, and were made at the time he was receiving an honorary degree. Mr Singh's defenders point out that the Raj left India with the English language and helped to inspire the writing of the Indian constitution. "We should be comfortable with our past because we now have the confidence of our present," an official in the prime minister's office said. But it is unlikely the opposition will be so easily convinced. They do not think his case is strengthened by the fact that he quoted the greatest freedom fighter of them all - Mahatma Gandhi - in his speech as well as mentioning his successor, Jawaharlal Nehru. The other issue on which Mr Singh is under attack - from both his Communist allies as well as the BJP - is last week's Indo-US agreement on nuclear energy. The Communists - who see red every time Delhi is perceived as getting too close to the US - have already dubbed the deal a "sell-out" by India. But sources close to the prime minister told the BBC that the BJP government had in fact been trying to work out the same agreement with the US for the past three years. The official defended the deal and said it was beneficial for both the US and India. "The truth is we were desperate. We have nuclear fuel to last only till the end of 2006. If this agreement had not come through we might have as well closed down our nuclear reactors and by extension our nuclear programme," he said. The official also said that in the event of the US congress still blocking the sale of nuclear fuel to India, Delhi will now stand a better chance of getting the same from either France or Russia. The prime minister is also under fire for his comments on the proposed Iran-Pakistan-India gas pipeline. His remarks in Washington that the pipeline project was fraught with risks was seen by many in Delhi as another example of his capitulation before the Americans, who have already indicated their opposition to the gas pipeline project. Here again the prime minister's aide told the BBC that he had only stated the obvious. "The truth is that we are discussing the security implications of the project with Pakistani officials right now." The official added that Tehran was also reconsidering the project in the light of recent incidents on the Iran-Pakistan border. But the impression has stuck that there's a question mark over the ambitious pipeline project only because of pressure from the US. And Mr Singh's political enemies are now trying to inflict maximum embarrassment on him over these issues. While the opposition is certain to make the going rough for the prime minister in the parliament session, the biggest threat he faces comes from within the ranks of his own party. While those close to the prime minister deny any differences between Mr Singh and the Congress president, Sonia Gandhi, the political grapevine in Delhi is rife with rumours of discord between the two. 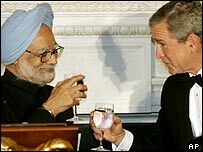 There are many Congress leaders - particularly those who want to step into Mr Singh's shoes - who hope that recent events may cause the Manmohan-Sonia relationship to sour.